Heaney’s artist-friend, Colin Middleton (who saw himself as the only Irish ‘surrealist’ of his time and to whom the poem is dedicated) is composing a landscape painting in his own very personal style. Heaney’s poem creates its own word-canvas of the painting in progress reporting the transformations Middleton imposes en route. Often preoccupied with his own issues of poetic composition and personal imprint on his poems, Heaney observes the techniques and overlays of a creative act exercised within another medium. The initial big-brush outlines and washes executed with hogshair wedge reflect things much as Heaney sees them: Middleton works on the different segments to distinguish between the granite and the clay, using washes of muted colour (blue … grey), until contrasts emerge (Till crystal in the rock is bared) and grounds are more sharply defined (Loaded brushes hone an edge). Setting perspective pits artist against Nature: outstared by the strength of Middleton’s superhuman concentration, the landscape cowers (outcrops of stone contract). 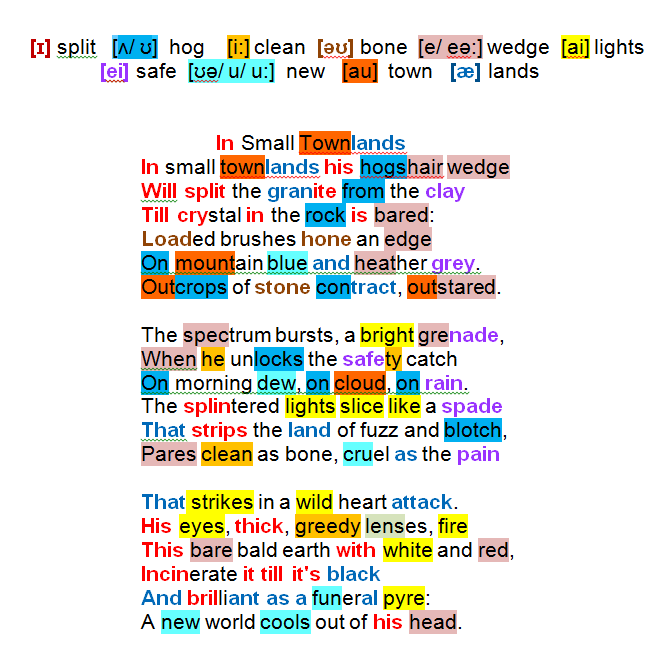 The background fixed, Middleton’s surrealist impulses suddenly explode (a bright grenade/ When he unlocks the safety catch); bright colour (spectrum bursts) is injected into colour-neutral subjects (dew … cloud … rain); light is defined in sharp, detached beams; visibly splintered, the shafts slice like a spade. Middleton’s radical brush technique removes unwanted blur (strips the land of fuzz and blotch) to leave edges pared clean as bone as sharp as life-threatening sensations: cruel as the pain/ That strikes in a wild heart attack. From creation to creator: Middleton’s short-sighted eyes (thick lenses), devouring the subject-matter (greedy), baking bare, bald earth in a furnace of white and red, burning it to a cinder (Incinerate … till it’s black), cremating it brilliant as a funeral pyre. Heaney applauds Middleton’s ability to impose seismic change: A new world cools out of his head.